Yesterday, Cbssportsline.com senior NFL writer Pete Prisco released his overrated and underrated players for every NFL roster. The two players making the list for the Eagles were cornerback Asante Samuel and wide receiver Jason Avant. Of course, both were on the list for entirely different reasons. Last year, Avant proved to the Eagles and scouts around the NFL that he was one of the most valuable weapons on the Eagles offense. Avant posted career highs in receptions (41), yards (587) and touchdowns (3). While he does not put up Jeremy Maclin, Brent Celek or DeSean Jackson numbers, he was the safety blanket for the Eagles offense. Any time the birds needed a big play or to jump-start the offense, offensive coordinator and former Eagles quarterback Donovan McNabb called his number. His play was so instrumental to the flow of the offense that the Eagles gave him a contract extension earlier this offseason even though he was restricted free agent. More importantly, he has a tremendous set of hands and might be the best No. 3 wide receiver in the league. "He is a steady No. 3 receiver who knows how to make plays on third down. He has great hands, rarely dropping a pass," Prisco wrote. The only other player that should be considered for this spot is center Jamaal Jackson. Before his season-ending injury, he was playing at an All-Pro level. Furthermore, Dallas and Denver dominated the Eagles line with him on the sideline. His presence was sorely missed last postseason as the Cowboys dismantled the Eagles. On the other side of the spectrum, Prisco called Samuel the most overrated player on the Eagles roster. One reason Prisco claims that Samuel is overrated is due to the fact he shies away from tackles and gives up a fair amount of big plays. "He is a gambler who can make a big play, but give up some as well," Prisco wrote. "And he doesn't tackle at all." Earlier this offseason, Samuel told reporters (also went off on Paul Domowitch) that he did not know where he had to improve his game because he made the Pro Bowl and registered nine interceptions. A major problem that Samuel failed to realize is opponents down the stretch threw bubble screens and ran basic screens to his side of the field on purpose because he refused to make a tackle. This kept the defense on the field more than they should have been and wore them down against elite teams like Dallas. 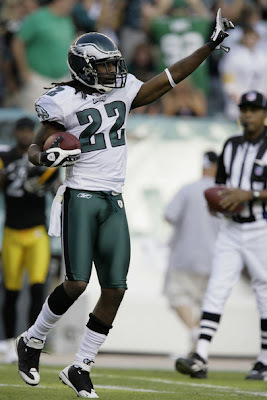 Without a doubt, Samuel is the best playmaker on the Eagles. He proved that much during the 2008-09 playoff run, where he seemingly had an interception in every game, which set up a touchdown or was taken to the house. On the other hand, his inability or unwillingness to make a tackle prevents the Eagles from getting three-and-outs more often. Additionally, his attitude towards the franchise and the media has taken a turn for the worst. It appears that he wants no part of the rebuilding process or to be in Philadelphia much longer since he called out the front office. In addition, Samuel might see the writing on the wall in view of the fact that he is 29 years old and owed a lot of money in the upcoming seasons. Still, there are some better options on the Eagles roster for being anointed as overrated. Jason Peters would be the prime candidate bearing in mind that he is being paid like a top five in the NFL. Moreover, the Eagles gave up a first round pick to acquire the heralded tackle. Peters has shown flashes, but has not been consistent (even with the Bills). Other players such as Stacy Andrews and Ellis Hobbs could also be mentioned seeing as the Eagles have praised them all offseason. Ultimately, if Samuel can just improve his tackling, there is no reason why he would make this list. However, he should not feel too bad since Troy Polamalu, Rashean Mathis, Greg Jennings, Jeff Saturday and former Eagle Brian Dawkins were deemed overrated as well.